I have already shared one Launji with you guys before (Methi Ki Launji). So, here is a second one. Launji is nothing but khatta-meetha (Sweet and Sour) combination of spices. It can be literally made with any ingredient, with these exact spices listed. As I know most of us eat bell peppers on a regular basis, so thought will give this recipe. Add chopped shimla mirch, haldi, namak, lal mirch powder and dhaniya powder to it fry for 2 min. Add about 1/2 cup of water, cover the pan and let it simmer till shimla mirch is cooked (not mushy, but cooked). Add amchur, garam masala and cheeni to it and cook till cheeni is nicely dissolved. Make sure the launji is not runny, so please do not add any more water than needed. It is not a complete dry curry but not even a gravy curry, somewhere in between. It should be just that the sauce has coated the shimla mirch and not more than that. Serve it with either roti/paratha or poori. As I said for "Methi Ki Launji", this is also prepared and stored in refrigerator and used by warming it when needed. It can easily stay up in fridge for 2-3 weeks. 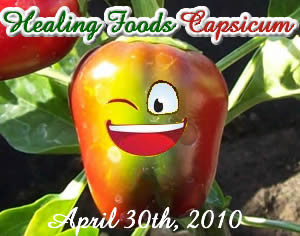 Sending this dish for Healing Foods - Capsicum event hosted by Erbe In Cucina, originally started by Srivalli. That's all for now. Till next post, take care. Yummmyyy!!! !makes me hungry, such a delicious dish..
Quick and simple capsicum dish.Peppers are sure a staple in my house.Will try it. Laungi means sabzi I guess....simple one..
Lovely! The sweet n sour bell peppers are glistening like jewels and tempting me to take a bite at it! @ Sayali, Launji means sabzi, but like sweet and sour sabzi. We don't call every sabzi Launji. Makes sense? Never tried them before! Looks very tempting! Love the color. yummy dish, good to know all about your local cooking..
what a great way to jazz up bell peppers! the spices look amazing in this dish. i bet i can just eat this with rice and nothing else! no meat required for me! 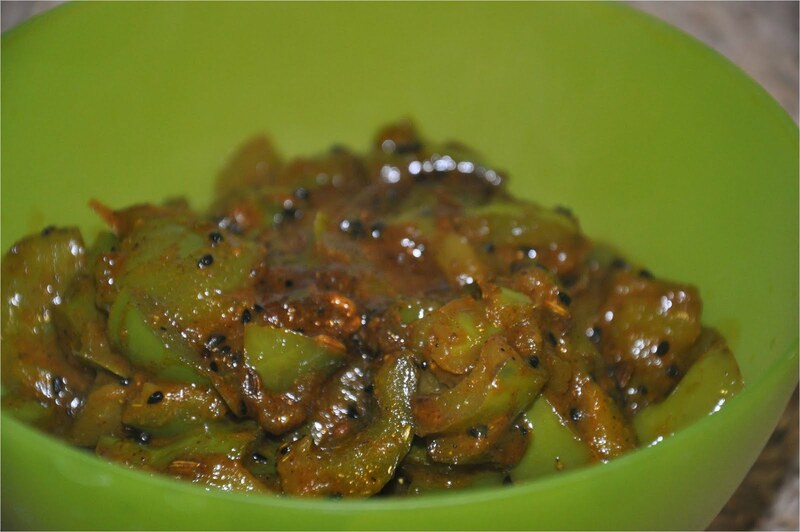 woooow,,Priya quick n simple recipe with capsicum ahh looks great dear..
A very nice and a different preparation of bell peppers. Thanks for sharing. Looks mouthwatering. Perfect with rice or chapathi. I love spicy food, esp the one with peppers or chilies..and you have said it is sweet and sour..must be good with rotis. Dear Priya,I have some awards for you at my blog please accept them. oh this is so beautiful...we make bell peppers too...our version has tamarind in it...i willl surely try yours! I am drooling over the picture now!! I love this a lot,thanks for the recipe! M'Baazi - Dry Bean Nairobi Style for A.W.E.D.